The way people view movies on mobile devices will have profound implications for the movie industry, according to former film financier Angus Finney. ABU DHABI -- One-time film financier and production executive Angus Finney, who now runs Europe's Production Finance Market, predicts people will be watching movies first on tablets and mobile devices "within months." Finney, the former Renaissance Films chief, says the shift will have profound implications for the movie industry while giving a Masterclass at the Abu Dhabi Film Festival. Finney said tablets and cellphones will take over as the dominant screen “within months, not years." "You only have to notice the number of people who watch movies and TV shows on handheld devices," he said. "That’s going to require a lot of thought as to the kind of content people make." The finance expert, whose clients include ADFF organizer Twentyfour54 and $2.4 billion City of London fund manager Octopus Investments, delivered his verdict to mostly young Abu Dhabi filmmakers. Finney spent two hours explaining how the film industry works and the qualities you need to be a successful producer. “Stars are struggling because they mean less. They don’t dictate the market any more, and, as a result, they don’t earn so much,” was among Finney's opinions. The author goes on, but I find chaotic with opinions and such all over the place. Bottom line, I would find it hard that the preferred method of watching something on a small screen. I myself don't get it and quite frankly don't even give that concept a chance. I mean I will never entertain the idea of watching anything of length on a small iPad or phone. So like some of the posts, I can't see this taking any kind of fast transition. No matter how far technology advances in the Home Entertainment market, there will always be a need for Movie Theaters. It offers something these gadgets or even your own personal Theater doesn't have and that's social interactions with strangers that share in the same thing you are currently involved with. The only time I've watched a movie on my iPod is when I was stuck at the airport for a couple hours, I'd thrown "Blame It On The Bellboy" on there (an old fave of mine) cause it's just the movie I'd want to see when I'm down or annoyed, it cheers me right back up. But that was before I got a new laptop that had a good screen and good battery life and the sound worked fine, then I started storing movies on there (including BIOTBB) but only for flights or something like that, otherwise I'm watching on my TV. I like having the option of seeing something on the smaller screen for emergencies, but it's totally not my platform of choice. Why would it be? I definitely don't have issues with watching a movie when you're on the road. But to order a new movie On Demand or Netflix and watching it on a iPad or whatever device just doesn't sit well with me at all. Faves are okay, but a new movie is still an Event for me and I need to see it on something big. The online world was buzzing last week when it was suggested by a few popular bloggers that talking, texting and other activities that many consider a distraction from the movie-watching experience should not only be allowed – but encouraged – by theaters. And though the great majority of cinephiles bristled at the idea that anything short of rapt concentration is acceptable conduct during a screening, the debate got me thinking: could the second-screen experience actually benefit some of my favorite films? As someone who once threw a medium-sized cup of soda on a guy who wouldn't stop talking during The Blair Witch Project, I don't entertain this topic lightly. But as someone who also consults IMDb.com occasionally while watching a movie in my living room, I can't help wondering if screenings designed to accommodate audiences with similar habits – and possibly cater to those habits with added-value elements – might be exactly what it takes to bring superhero, sci-fi and other genre movies to the next level of geekery. Imagine, if you will, a “Second-Screen Experience” as one of the screening options at your local theater alongside the 3D, IMAX 3D, IMAX 2D, and standard 2D screenings. When you buy a ticket to the second-screen format for Star Trek Into Darkness, for example, it's accompanied by one of those pixelated QR codes you can scan with your smartphone or tablet. Scanning the code allows you to download a program or otherwise receive access to all sorts of additional content (such as deleted scenes, character bios or other special features), but also offer material tied to the events on the screen as they're happening. Like getting Pink Floyd's “Dark Side of the Moon” to sync up with The Wizard of Oz (but infinitely easier, of course), the process of creating an interactive app experience could simply involve a tap on your device's screen at the right moment – via big-screen cues or instruction from the theater itself. Once the app on your device is in sync with the movie being shown, the second-screen experience could begin with director interviews and other content to peruse on your device while you're waiting for the film to start, with the real fun beginning when the movie itself starts rolling. 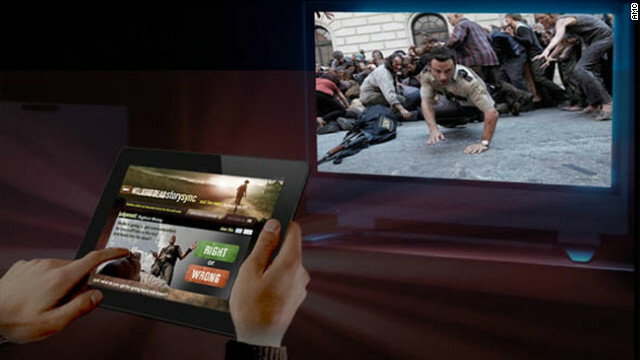 In many ways, the second-screen viewing experience would mimic the sort of features currently available on some Blu-rays, bringing an interactive version of “Pop-up Video” to your smartphones and tablets with the added bonus of watching all the action on a theater-sized screen, with theater-quality sound, in a crowd of like-minded fans. Audiences would be encouraged to bring their own headphones (or purchase them from the theater, airline style) for any second-screen content that featured an audio element, and the lights wouldn't be dimmed to the traditional, near-dark levels to allow for easier viewing of both the big and small screens. When each of the gigantic, monster-fighting Jaegers and their pilots are introduced in Pacific Rim, for example, imagine if the app on your smartphone or tablet provided you with a brief bio of the characters, how they came to be fighting Kaiju, and an animated clip from one of their past battles. And what if the app on your smartphone gave you the background on all of those hidden callouts to other films in the Marvel movie-verse when you watched The Avengers or any of the films leading up to it? It takes a certain type of movie to make good use of the second-screen experience, and let's be honest: those films generally come from the geekier side of Hollywood. Whether it's Star Trek, Transformers or X-Men, these films all hit the screen with lots of history and preexisting material supporting them, and that's why they're perfect candidates for the second-screen experiment. Heck, just imagine if any big superhero movie was accompanied by an app that showed you panels from the comics that inspired particular scenes in the film as those sequences were unfolding on the screen? And then if that same app provided a link to a digital version of the aforementioned comic to read on the way home from the theater? Not only is that good synergy, but it may be adding yet another new reader to the comics market. And here's the best part: this could all be happening in its very own, dedicated theater, separate from the standard no-talking, one-screen-only theater. Yes, by appealing directly to the talkers and texters and drawing them away from more traditional screenings, the second-screen option could actually save the theater experience for everyone who wants to focus on the filmmaker's work without any distractions. But for those who do see the appeal in the second-screen experience, there's a good chance they'll find a lot to like – and learn – from their time at the theater. Why not have a separate "Text Only" theater just for the idiots that still want to text or talk during a movie? Charge more per ticket to cover the loss of sales and see how that plays out. My guess, not many would want to pay higher cost and will have to abide by the rules of regular screenings. Why this is still even an issue is beyond me. If someone texts, kick them the f*ck out as they are not following house rules.